Ambulance, fire engines and police landrovers at the scene of the explosion at the Red Lion pub on the Ormeau Road, Belfast, N Ireland, on 2nd November 1971. 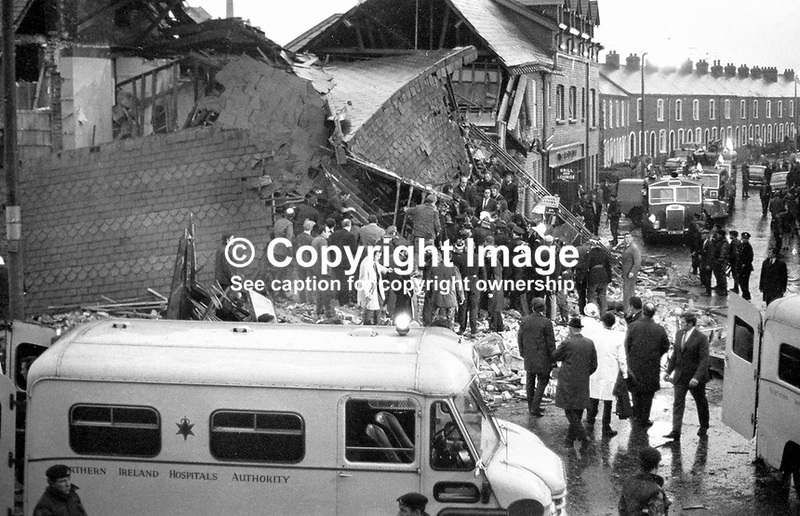 Three men died in the Provisional IRA bombing. The bar was beside Ballynafeigh RUC station. 197111020430b. Please see my Terms and Conditions of Use at www.victorpatterson.com. It is IMPORTANT that you familiarise yourself with them. NUJ rates unless agreed otherwise. The right of Victor Patterson to be identified as the author is asserted in accordance with The Copyright Designs And Patents Act (1988).